Cornwall is located in the far south west of England on a peninsula that stretches into the vast Atlantic Ocean, with a dramatic coastline of almost 300 miles it is almost completely surrounded by the sea. The county is split into three sections North Cornwall, South East Cornwall and West Cornwall. Cornwall has many leafy estuaries, captivating fishing harbours and villages, spectacular beaches, and an abundance of exotic gardens and beautiful meadows that flourish in Cornwall’s mild climate. Cornwall is also home to the captivating wilderness of the Bodmin Moor with fascinating prehistoric remains, fantastic walking trails from gentle strolls to challenging hikes, many castles, intriguing towns and villages and holds many local legends. At the beginning of the 19th century Cornish mines were some of the largest anywhere in Europe and the copper industry, centred in West Cornwall, grew beyond any other sector in the British economy. In the old industrial heartland, the landscape has been awarded World Heritage Site Status and is dotted with remnants of its mining past illustrating Cornwall’s enormous contribution to the Industrial Revolution with engine houses, museums and miles of recreational trails. Cornwall’s martime legacy is never far away where local fishermen land their daily catch of fresh seafood and where tall ships, luggers and ketches unfold their sails in the Cornish breeze. Cornwall has long been one of the most popular UK holiday destinations and is a truly wonderful and beautiful county. Its natural environment is recognised nationally as the Cornwall Area of Outstanding Natural Beauty which can be enjoyed by everyone and can be accessed by the South West Coast Path. The flourishing tourist industry provides a host of accommodation options such as holiday cottages, camp sites, caravan parks, hotels, bed & breakfast and guest houses. South East Cornwall is much calmer than the exposed north coast with family friendly beaches, picturesque fishing villages, rolling green hills and lush river valleys in a landscape steeped in history. The main towns and villages of this area are Callington, Charlestown, Fowey, Liskeard, Looe, Lostwithiel, Mevagissey, Poloerro, Saltash, St Austell, St Germans, Stoke Climsland and Torpoint. They all have something different to offer for visitors of all ages from fishing harbours to riversides, old streets to antique shops and lazy beaches to vigorous walks and much more. There are also many hidden treasures from quaint hamlets to solitary coves waiting to be explored. Fowey (pronounced Foy) is a historic seafaring town situated on the west bank of the River Fowey with narrow winding streets and wonderful sea views that appear around every corner. The town is a thriving commercial seaport and is a haven for yachtsmen attracting many sailing dinghies, yachts, schooners and motor launchers. Fowey Regatta week held in August is very popular with competitive sailing events, a street carnival, a Red Arrows display and much more. Fowey has a selection of quality shops, cafes, pubs, restaurants and galleries many exhibiting local works and has been the home to many famous people over the years. The Fowey Estuary is one of the most attractive and unspoilt areas of Britain’s south coast surrounded by miles of beautiful open countryside most of which is owned by the National Trust. The River Fowey rises at Fowey Well about a mile north west of Brown Willy on Bodmin Moor and enters the English Channel at Fowey. The river runs through two Sites of Special Scientific Interest, one of which is also part of a National Nature Reserve. The Fowey valley, designated as an Area of Outstanding Natural Beauty, has pleasant sites and special paths with an abundance of wildlife along the banks of its river making the valley very popular with tourists, hikers and walkers. The river is also famous for its sailing because of its natural harbour and kayakers and canoeists paddle the river from the whitewater sections high up on the moor all the way down to the estuary. 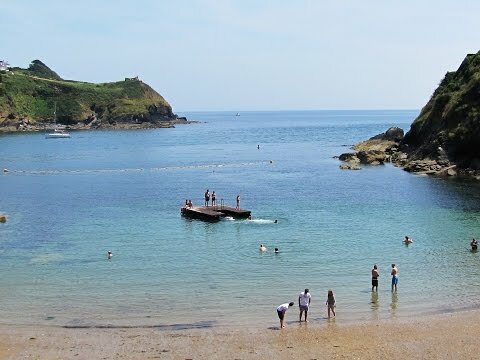 Ferry services from Fowey are to Polruan which is a passenger and cycle ferry, to Bodinnick which is a vehicle ferry and to Mevagissey which is a passenger ferry. St Catherine’s Castle which sits on the rocky headland of St Catherine’s Point was built in 1536 by Henry VIII to protect Fowey harbour from French Invasion. The small castle consisting of two storeys with gun ports at ground level is managed by English Heritage and is one of several fortifications built by Henry VIII along the Cornish coast. Blockhouses were added to each side of Fowey harbour mouth for extra support and the blockhouse facing Polruan held six cannons but was refurbished to form a two gun battery below the fort during the Crimean War and then used as a practice battery towards the end of the 19th century. The castle remains can be approached by a short path from the beach or the car park at Readymoney Cove. Gribbin Head is a green headland on the Polperro Heritage Coast with superb sea views. Known locally as “The Gribbin” it separates the estuary of the River Fowey and the harbour of Par. Gribbin Tower a red and white striped day navigation beacon which sits on the headland was erected in 1832 as a safety measure for navigation into Fowey and the harbours of St Austell Bay. The tower standing at 26 metres was never lighted. Gribbin Head owned by the National Trust organises regular open days during the summer months when visitors can climb to the top of the tower. Situated on the headland of Gribbin Head is a place called Menabilly this is where Daphne du Maurier, the famous Cornish author, lived for many years in the 17th century mansion overlooking the sea. The countryside, footpaths and coves provided inspiration for much of her writing. She was born 13th May 1907 and grew up in London then in 1926 her family found a second home called Ferryside situated on the bank of the River Fowey in Bodinnick. This house became Daphne’s home until she married in July 1932 and moved away. For 10 years she only returned to Cornwall for holidays then moved into a rented house called Readymoney in Fowey with her three children while her husband was at war. She then moved into Menabilly in 1943 until the lease expired on the mansion in 1969. She then moved to another house Kilmarth about a mile from Menabilly. Daphne died on the 19th April 1989 and a festival is held in Fowey each May celebrating her life and work. The small village of Polkerris is a hidden gem on the east side of Austell Bay and the approach is via a single steeply sloping road and parking is limited. The village with its small sandy beach and curved harbour is part of the Rashleigh estate and home to a pub The Rashleigh Inn, a cafe and a shop. The cafe is the site of the old boathouse which closed in 1922 after a new lifeboat was stationed at Fowey for the first time. The Rashleigh Inn was the setting for the 1972 film Doomwatch and some residents of Polkerris took part in the film as extras. Mackerel fishing was the mainstay of the village from the 17th century until the collapse of mackerel stocks in the late 19th century due to over fishing but today the village is a tourist attraction during the summer months. The Polkerris Beach Company on the beach is a shop and centre open daily between late March and the end of October. It is based in a 17th century pilchard store and provides equipment for rental and facilities for water sports and also windsurfing and sailing courses. The South West Coast Path is England’s longest long distance footpath and a designated National Trail mainly funded by Natural England and maintained by a dedicated South West Coast Path Team. It stretches for 630 miles from Minehead in Somerset, along the coasts of Devon and Cornwall to Poole Harbour in Dorset. The trail passes through two World Heritage Sites which are the Dorset and East Devon Coast known as the Jurassic Coast and takes in much heritage, wildlife and geology. The path was originally for the coastguards to be able to walk from lighthouse to lighthouse patrolling for smugglers hence the path runs close to the coastal edges so that they could look down into every bay and cove. The Saints Way runs for 27 miles from Padstow to Fowey it is well marked and guide books are available. The route follows the probable route of early Christian travellers making their way from Ireland to the Continent. Rather than risk the difficult passage around Land’s End they would disembark their ships on the North Cornish coast and continue to ports such as Fowey on foot. We turn right out of the car park and walk up to the road to the church, turn left and take the Saints Way. We walk slightly downhill to a B&B then turn right and left through a farm and follow the sign Fowey 2½ miles. We keep heading forwards following the Saints Way to a road. We turn right then immediately left down Lankelly Lane. At the main road we turn right and head forwards following the road towards Fowey turning right at the Safe Harbour pub down a lane with a post box and telephone box on either side with the church tower in the back ground. We make our way through the church yard to the quay. We make our way to the far side of Fowey to view Daphne du Maurier’s house and then return to the Quay. From the quay we take the narrow street on the left the church is on the right in front of us. We follow the street round to the left and take the coastal road. When the road splits we bear off to the left following the wall on our left to St Catherine’s point. We pass a tiny beach and public toilets the footpath sign says Coast Path Polkerris via The Gribbin 4¾. We head steeply up a stone path through the trees for a short way and turn left. (If you keep heading forwards uphill it will take you to Lankelly Farm). We keep following the South West Coast Path, along the top of the cliffs, too The Gribbin (Tower) on Gribbin Head and then continue following the South West Coast Path passing a fresh water pond and beach at Polridmouth. We keep following the coast path towards Polkerris and when we see the field where we parked our car we turn left at the sign post downhill through the trees to Polkerris beach and harbour. We walk up the road through the village for a short way and turn left to walk in front of the toilets then turn left and keep heading forwards uphill on the path through the trees to the top. Our car park is on the left. This is a moderate walk on the good paths and tracks using the Saints Way and the South West Coast Path. There are some steep inclines and declines. Approx 7 miles allow 3 hours 15 minutes using OS Explorer Map 107, St Austell and Liskeard. Start Point: Car park in a field above Polkerris. Honesty box £2 all day. Polkerris is near Fowey on the South East Cornish Coast. From the A30 after Bodmin take the B3269 turn right onto the A390 then left back onto the B3269 and follow the signs for Fowey and Polkerris. The car park is on the right in a field above Polkerris on the no through road to Hambland there is also limited spaces in the car park near to the beach. There is also a car park in Fowey. There are public toilets in Polkerris and for refreshments there is a pub the Rashleigh Inn, a cafe and a shop. In Fowey there are public toilets and many shops, cafes, take-away, pubs and restaurants. There are also toilets at Readymoney Cove near St Catherin’s Point. Way cool! Some extremely valid points! I appreciate you writing this post and also the rest of the site is also really good.